Pontoon Boats have come a long way since their beginning in the 1950’s and 1960’s. Today’s pontoons are symbol of comfort on the water. A pontoon boat can provide fun and relaxation for the whole family. Don’t waste one day of cruising around Lake Minnetonka because your boat is in need of Serious Repair. Anchor Marine Repair is an Insurance Approved Vendor that provides fast and affordable repair of all types of pontoon damages. Contact us for Driver at Fault Accident Repair or Storm Damage Repair. Our technicians are well qualified to repair, update, renovate or customize your prized pontoon. Everybody loves a good pontoon boat on a beautiful summer day. Nothing beats the feeling of relaxing and enjoying the breeze and scenery on a comfort of a pontoon. With all of the usage that you can have with a pontoon boat in Minnetonka, MN it is no wonder that your boat may be showing signs of wear. Take it into Anchor Marine Repair for some much needed updates or a complete custom renovation. Our Repair and Renovation services are Fast and Affordable. The skilled Boat Repair Technicians are wizards at fixing up well worn pontoon interiors and exteriors. Our state-of-the-art facility is well equipped to handle any sort of Pontoon Storm Damage Repair. Anchor Marine Repair is also an Insurance Approved Vendor for driver at fault Accident Repair. We will have it fixed up and looking better than ever before. Your Pontoon Boat is built for your enjoyment. While its in the Anchor Marine Repair facility for repair work it is a great time to add updates. Anchor Marine Repair has a highly experienced crew of boat loving repair technicians. We are an Insurance Approved Vendor for Accident Repairs as well as Pontoon Storm Damage Repair. 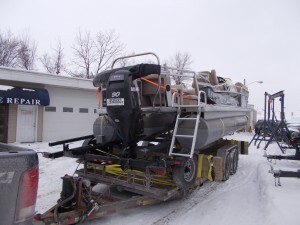 Why not have your prized pontoon boat customized while its in for repairs? Bring it in for Fast and Affordable Repair work and enjoy the rest of the pontoon boating season in style and comfort. Better yet, have us pick up your damaged pontoon boat and deliver it back to you in excellent shape.